When planning the repair of a complicated congenital heart defect, surgeons from the Children’s Hospital of Los Angeles recently turned to 3D printing. Using a life-sized 3D model created from the patient’s magnetic resonance imaging (MRI) data, the surgical team was able to shorten the length of the surgery, while also eliminating the need for multiple surgeries that otherwise would have been required. Surgical planning is an important part of patient care. Often surgeons rely on MRI, computed tomography (CT), or other forms of imaging to develop an understanding of the patient’s anatomy and disease. Examining two-dimensional (2D) images requires the surgeon to form an image in their mind’s eye, which may not be completely accurate. It is also possible to generate 3D images, which provides another level of detail. However, even 3D images may not capture certain defects. When confronted with an unusual congenital heart defect, surgeons from the Children’s Hospital of Los Angeles (CHLA) decided to move beyond diagnostic imaging, according to a recent press release issued by the hospital. They used 2D and 3D MRI scans from the young patient, Esther Perez, to generate a 3D-printed model of her heart. By studying the model before the procedure, cardiac surgeon Richard Kim, M.D., was able to more accurately plan, thus streamlining the surgery. The enhanced surgical planning enabled by the 3D-printed heart provided led to greatly improved outcomes for Perez. Instead of needing multiple surgeries during the first year of her life and spending countless days in the intensive care unit, she was able to rapidly recover from her single surgery. This is not the first time a 3D-printed heart model has been used by surgeons to prepare for pediatric surgery. Last year, Erle H. Austin III of Kosair Children’s Hospital in Louisville, KY, used the approach to develop a strategy for repairing multiple heart defects in a 14-month-old child. And as the cost of 3D printing continues to decrease, the method is expanding beyond cardiac procedures as a surgical planning tool. 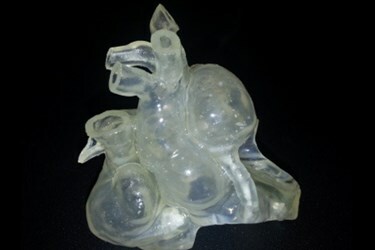 For example, surgeons used a 3D-printed model when preparing to repair a complex shoulder fracture called a “floating shoulder” in a severely injured Chinese patient, according to an article on 3D Print.com. In addition to surgical planning, 3D printing has also been used for other types of treatment planning. For instance, using 3D printed models of organs that mimic the density of the organs in a patient’s body, oncologists were able to more accurately determine the appropriate dose of radiation, according to a recent article on Med Device Online.